We all have things about ourselves that we would like to change. Some aspects may be major issues that require a fair amount of work, like our weight. Depending on how much weight you want to lose or gain, it can take a considerable time and effort in diet and workouts to get to where you want to be. But what about keratosis pilaris? It is probably a condition you haven’t heard of before, and you may not even realize that it affects a number of people—quite possibly including you. And if you want to know how to get rid of keratosis pilaris, lucky for you, there are some easy, natural options. Keratosis pilaris, also referred to as chicken skin, is a skin condition that leaves little bumps, brown spots, or both on your skin. It usually occurs on your upper legs or upper arms, and is caused by a buildup of keratin around the hair follicles in those places due to the clogging of the pores with debris and dead skin. The skin condition gets its name from the associated roughness of skin, similar to the texture of the skin on a chicken. The bumps can occasionally become inflamed, causing them to turn red. It doesn’t necessarily affect your health medically; it might simply be an issue for those who don’t like the look of the bumps and the feel of the rough skin. So, what’s the best way to treat keratosis pilaris? In this article, we’ll take a look at keratosis pilaris and how to get rid of keratosis pilaris naturally. You have noticed a batch of keratosis pilaris on your upper arms and you would like to get rid of the bumps. The next step is to determine how to treat chicken skin bumps and, if you prefer non-medical routes, how to treat them naturally. As it turns out, there are a number of ways get rid of keratosis pilaris naturally. A simple way to potentially prevent and help get rid of chicken skin is to exfoliate your skin, especially on your upper arms and legs. You can make something like a scrub, using two teaspoons of sea salt and four teaspoons of honey. Apply the scrub to the area affected by keratosis pilaris and let it sit for 15 minutes. Rinse the scrub off after 15 minutes with warm water. Dry brushing is simply that: using a dry, natural bristle brush on the skin. This can help gently remove dead skin and debris that can cause keratosis pilaris to occur. In the winter months, your skin can become dry and cracked and create a perfect surface for keratosis pilaris to form. Using a humidifier could help keep your skin hydrated and possibly stop chicken skin from developing. Combining two tablespoons of coconut oil with two tablespoons of sugar will create another scrub that may help with your keratosis pilaris. Apply the mixture and allow it to sit for a few minutes before washing it off. The coconut oil’s anti-inflammatory properties could help calm and get rid of the keratosis pilaris. Furthermore, the sugar helps to exfoliate the skin, allowing the coconut oil easy access to the affected area to help clear it up. Tea tree oil has been used for many skin issues due to its reported antibacterial and antiseptic properties. By diluting a few drops of tea tree oil with another carrier oil (like olive oil) or water, you can use the mixture to help calm inflamed keratosis pilaris. It could also help clear out the dead skin, debris, and keratin that are causing the chicken skin. Vitamin E oil may be a great tool for helping to treat chicken skin bumps or keratosis pilaris, as it could soften the bumps after they’ve appeared. This can be accomplished by massaging the contents of a vitamin E capsule into the affected area or adding a few tablespoons of vitamin E oil to your bath. Just make sure you soak in it for at least 15 minutes. Apple cider vinegar is used in countless home remedies, including those for skin issues. As it turns out, it may be able to help you with keratosis pilaris. Using three or four tablespoons of apple cider vinegar and a cloth, rub the apple cider vinegar into the affected area. This could help remove dead skin, soften the bumps, and clean out the debris that may be causing them in the first place. Straight apple cider vinegar may be too strong for your skin, so dampen the cloth as that will help dilute it. A natural remedy for many skin issues for centuries, witch hazel could be effective at treating keratosis pilaris. Take a few leaves of witch hazel and crush it with some water to create a paste. Apply the paste to the area of skin affected by keratosis pilaris and leave it there for about 15 to 20 minutes. Rinse off the paste. 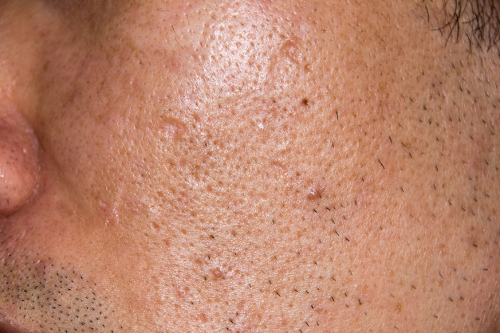 After a few treatments, you may start seeing your skin in a better state. It may be hard to believe, but yogurt could also help you get rid of your chicken skin—and not by eating it. Take three to four tablespoons of natural yogurt and spread it upon the area afflicted by keratosis pilaris. Let it sit for 10 to 15 minutes before washing it off with a cloth. The yogurt could help exfoliate with its lactic acids, but it also helps to moisturize the skin at the same time. Using a mild soap can help your skin remain supple, moisturized, and healthy while washing away debris and other things that may lead to the keratin buildup. Combine two tablespoons of crushed oatmeal with two to three tablespoons of milk. Scrub the mixture into your skin in a circular motion, and allow it to sit for a few minutes before washing off. This scrub could help soften your skin and exfoliate at the same time, helping to get rid of your chicken skin. A change in diet may help in both treating and preventing chicken skin. Include more foods with a good deal of vitamin E content, like leafy greens, strawberries, pumpkin, and mango. Foods with omega-3 fatty acids like salmon are also a good idea. Keep well hydrated by drinking plenty of water. Not all of these chicken skin bumps treatment tips will work for everyone. There may be allergies or prescription medication reactions to consider when using any natural remedies. And for some people, keratosis pilaris is a genetic condition, so getting rid of it entirely may not be possible. If this is not the case for you, a natural remedy might be able to at least soften the area, if not outright get rid of your chicken skin. Keratosis pilaris is a skin condition that might be a little unsightly to some people, but at the end of the day, it isn’t a medical condition that you need to be worried about. You won’t lose an arm to keratosis pilaris, and it won’t eventually lead to your death. However, if you want to try to eliminate or tame the discomfort, treating chicken skin bumps, keratosis pilaris, with one or two of the above home remedies may do the trick for you. “17 DIY Home Remedies For Keratosis Pilaris,” Home Remedies for Life, December 4, 2016, http://homeremediesforlife.com/keratosis-pilaris/, last accessed July 11, 2017. Almanza, A., “Bye, Chicken Skin! 8 Ways to Finally Get Rid of Those Little Red Bumps on Your Arms,” Reader’s Digest; http://www.rd.com/health/beauty/keratosis-pilaris-chicken-skin/, last accessed July 11, 2017.